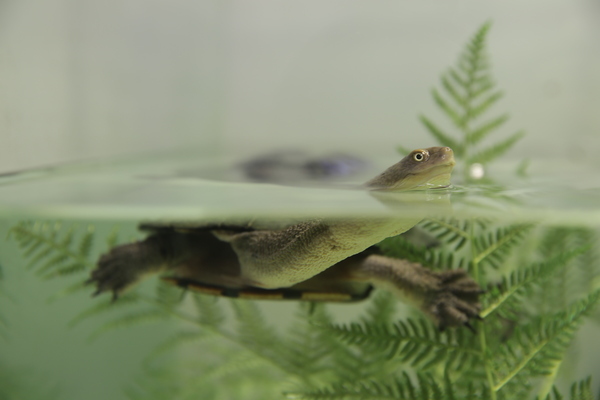 Long-necked turtle Toby is making an incredible recovery at Healesville Sanctuary’s wildlife hospital after being hit by a car. Toby is one of 22 turtles admitted this ‘Turtle Season’, which starts as the weather warms up and turtles search for a mate and a place to nest. They often search around roads and lakeside fishing spots where continual urban expansion is bringing people and wildlife into contact more regularly. Healesville Sanctuary associate veterinarian Dr Claire Madden said most turtles that ended up at the Australian Wildlife Health Centre had swallowed fish hooks or been hit by cars. “Luckily turtles are tough and, with our help, they can recover extremely well from their injuries,” she said. “Shell fractures are common, they hurt and can become infected, but with the right treatment they can also heal, just like human bones. Dr Madden said turtles needed warm temperatures for optimal healing. “So we provide a safe place for them to rest while they recover, which can take as long as eight weeks,” she said. Toby has progressed to the next stage of his recovery, with vets removing the hardware that had been helping his shell to repair. Nearly all of the turtles treated at Healesville Sanctuary’s wildlife hospital have recovered and been released back to the wild. It’s just Toby and his recovery wards mates, Tank and Tessa, left now and all will shortly be returned to the wild. The Australian Wildlife Health Centre sees up to 1500 wildlife patients each year. Victorians can help reduce this number by slowing down on roads and cleaning up fishing materials after use. Visitors to Healesville Sanctuary can see this important veterinary work at the Australian Wildlife Heath Centre where floor-to-ceiling glass walls are the only thing separating them from the hospital action.